It's hard to believe one of the most valuable Mercedes in the world is sitting neglected in a building in South Central Los Angeles, but that's exactly where writer Michael Mraz located Rudi Caracciola's 1935 Mercedes-Benz 500K. Few people know that one of the greatest cars Mercedes-Benz has produced in its 125-year history sits on flat tires, covered by 30 years of grime, in an unmarked building in South Central Los Angeles. The 1935 Rudolf Caracciola Mercedes-Benz 500K "Roadster Limousine," one of the most beautifully struck and elegant prewar cars ever built, was commissioned as a gift for one of the most legendary race car drivers ever to turn the wheel. Based on recent auction figures, the 500K-one of the holy grails of car collecting-could be worth upward of $10 million if it ever came to auction. But it sits nose to tail with scores of other exceedingly rare classic European cars as part of the mind-bogglingly vast inventory of the nondescript Porche (sic) Foreign Auto, an "auto dismantling" operation (junkyard is the more common term), which was founded in 1967 by a guy named Rudi Klein. 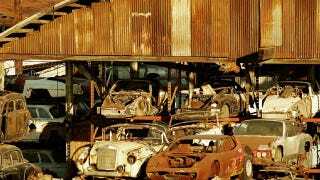 When Klein died in 2001, his amazing hidden collection of cars fell into the hands of his sons Ben and Jason Klein. While investigating the 500K Mraz started uncovering stories of the amazing cars the Klein's well guarded collection held. Michael Mraz quickly discovered he wasn't the only one who knew where the 500K was. Michael Kunz, manager of the Mercedes Benz Classic Center, has been chasing the car for a while and has actually inspected the car personally. Ever since he has been trying to make a deal with the Kleins to unearth the car. Ten years ago Mercedes tried arranging a loan agreement with the Kleins so the 500K could be displayed-alone in its own room- at the company's museum in Fellbach, Germany. (Audi had arranged a similar deal with the Kleins for the restoration of the Eva Braun Horch.) But the deal fell apart after Rudi Klein's death, in 2001, for reasons that remain unclear. "It was the right thing to do with that car," Kunz says. "I'm hoping at some point we can revisit that." Although Mraz was not able to inspect the car himself, he did eventually get the Klein's to briefly discuss the future of the 500K with him. I ask Ben Klein what the future might hold for this car, given its storied past. Will it finally make the pilgrimage to the Mercedes-Benz Museum, returning to the country whence it came? Will it wind up for sale and break another auction record? Will it continue to collect dust? Will it eventually crumble away into nothing? He doesn't give any hint. But he does reveal a telling detail when I ask him if the 500K was the car Rudi Klein, his father, was most proud of. "For sure," he writes. "He kept a picture of the car in his wallet." If this isn't proof there are still amazing cars waiting to be found and brought back to life, we aren't sure what is. Special thanks to Michael Mraz and Town & Country Magazine.